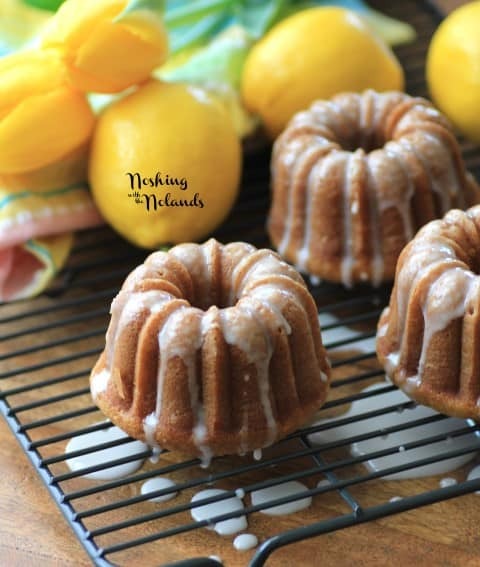 Mini Lemon Spring Bundts for #BundtBakers are moist and delicious! It is bundt time again and I am very excited because I am hosting this one today!! My very first time hosting anything!! So I am thrilled to bring you my theme of Easter with Mini Lemon Spring Bundts. What does Easter mean to you? Is it a deeply religious holiday or one where family and friends get together or little kids hunt for chocolate. Well it is all of that for me. Anyway you celebrate it, it also signifies Spring!! A rebirth of all that we have waited for all winter long. I had all sorts of ideas for this theme but none of them really came to fruition for me in my mind. Logistically they just didn’t make sense so I went with lemon. The flavor of lemon is so fresh and lively and it really screams spring for me and Easter!! 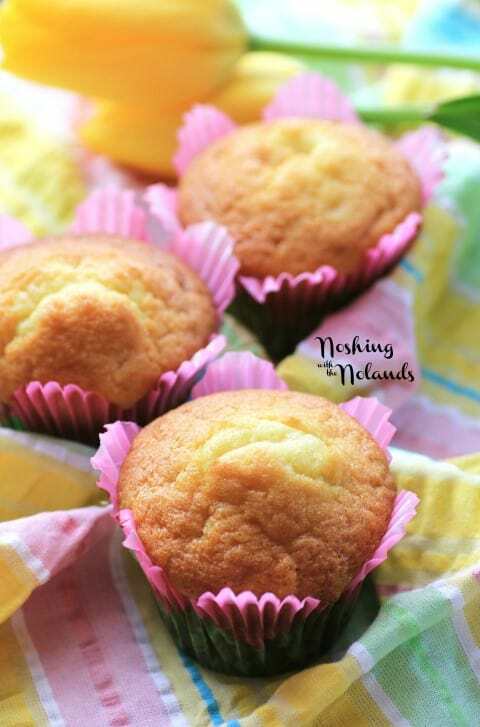 Fresh and lemony, easy and pretty!! These little bundts will take you a long way from breakfast to dessert!! Not only did I get six gorgeous little bundts from this recipe but I got 6 yummy muffins. This recipe will make one large bundt also!! Delight in making these gorgeous little bundts for your Easter or spring celebrations. ENJOY!! 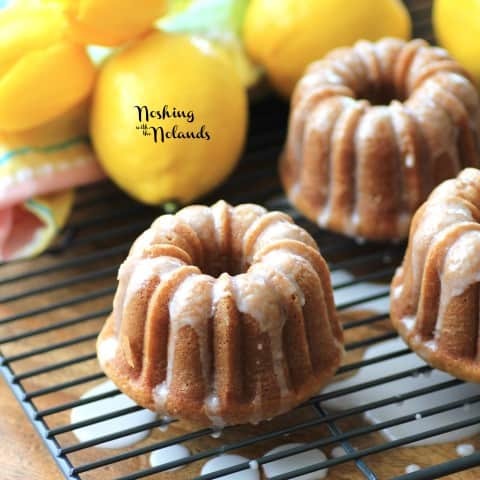 A scrumptious springtime bundt full of lemon flavor!! Preheat oven to 350F. Spray a six mini bundt pan and flour and line a 6 muffin pan with liners. Mix together the sugar and butter until light and fluffy in a standup mixer with a paddle attachment. Add the eggs one at a time and mix well. Add in the lemon extract and lemon zest if using. Mix in the pudding mix. Mix the flour and baking soda together with a pinch of salt. Alternatively mix in the milk, flour and sour cream, ending with the flour. Beat well for 2 min. Pour the batter into the mini bundt pan and the liners. Bake for 20-30 min. or until light golden brown and they spring back easily. Let cool and remove from pan. Mix glaze together and drizzle before serving. Come and see what my Easter Peeps have made for you, they all sound delicious!! Thanks so much Jane, I love my little mini bundt pan!! You know from recent posts that I am all about “mini” so I am going to share on my FB page Tara. These sound so good and look divine. 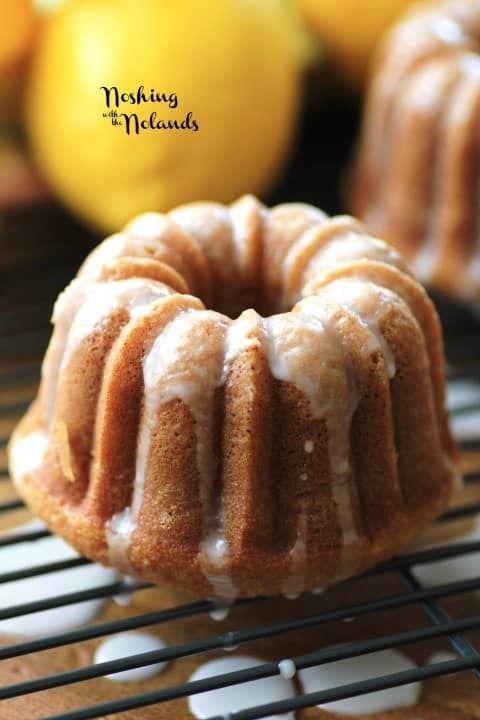 Yay for this recipe – just bought my first bundt cake pan and this recipe is on the queue. I was not a fan of lemon, but that got changed after baking some lemony cakes. I bet this will convince my love for lemons, too. It has a mild lemon flavor not too intense, plus they are super moist. I think you will like it!! The mini bundts are so cute! Too cute! You’re making me want to go find a mini bundt pan – stat. Thank so much Lauren!! I love my little bundt pan!! So adorable, Always on the lookout for a great lemon recipe, looks delicious! That is going to be the next pan I buy, Tara! I love your little lemon Bundts. The dripping glaze is gorgeous! Thank you so much for hosting this month. One can never have too many bundt pans!! G’day! Tthese look cute and delicious Tara! Thanks so much for coming over Joanne!! I was going to ask you if it would make a large bundt! I see it does! Lovely spring recipe… I might have to make it for my Honey soon! Thanks so much Kecia, a large one would be lovely too!! Thanks Becca, all the bundt pans are so much fun!! Oooooh, those are gorgeous and yummy looking. Lemon, to me, is THE dessert flavour of Easter. I am kind of hands down on the lemon thing this spring too!! Thanks Jennifer!! These are such pretty little cakes, Tara! Definitely perfect for Easter dinner! 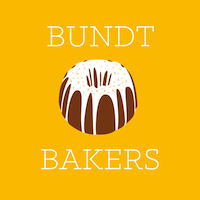 Your mini bundts are so cute! thanks for hosting this month. Thanks Veronica, first time hosting anything and I survived!! What pretty little bundts and how smart of you to make muffins with the leftover batter. I will have to remember that trick next time. Thanks Renee, the muffins worked well for lunchboxes!! I definitely need to get a mini bundt pan, since your bundts are just perfection. They are just the perfect size for sharing. Loving your photos too! I love this little mini bundt pan, it makes the perfect sized bundt!! Thanks Felice! !